Today is the perfect day to pick up a new streaming device for your kitchen TV or that TV in the guest bedroom, because Amazon is running a great sale on Roku devices. Roku makes the best-selling streaming dongles in the world right now, and its two newest and most popular models have both been discounted. 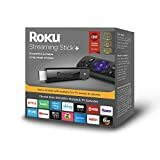 The Roku Streaming Stick drops to $39.99 from its normal price of $49.99, and the Roku Streaming Stick+ with 4K resolution and HDR support is only $54.00 right now on Amazon, down from its normal price of $69.99. These deals won’t last long though, so get in on the action while you still can.